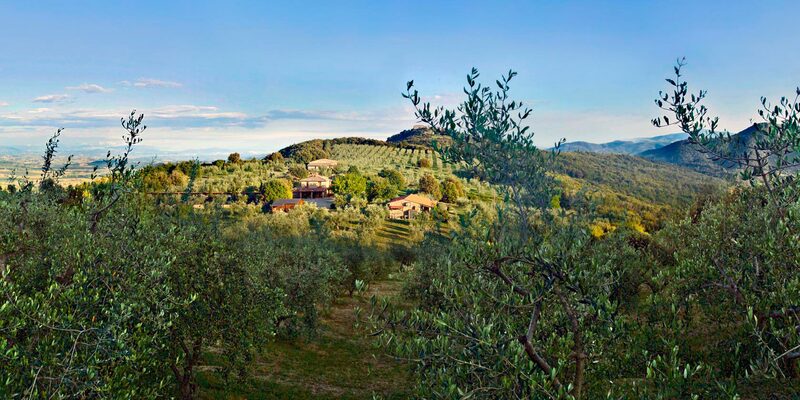 Montali Country House is placed on the top of a hill and lies within a 25 acre field where we planted 1500 olive trees. Our rocky soil is the perfect basis for them, as it enhances the oil quality and aroma. Although the nature of a poor ground as ours causes the production to be smaller than in softer, more fertile areas, the exceptional quality of the result makes it worthy for us. Besides, several varieties of trees take part in the process of making our oil. The reason why we do this is because we know that the best oils are the result of mixing up different olive plants. Most of our trees are Frantoio and Leccino (which improve the pollination of the trees), but there are also 10 more species involved in the task, adding hints of fruttato, the oil’s natural flavour, as well as a subtle but wide range of nice scents. Thanks to the hotel’s location, our trees are not affected by the olive fruit fly (Dacus olea), a very common insect that burrows a larva inside the olive and spoils it, adding a typical bitter taste to the oil. The fly’s natural environment tends to be a wind-protected area, like the Trasimeno Lake surroundings, so this might be a good moment for us to tell you it can get a bit a windy around here! All the olive oil we use to cook and sell at the hotel is extra virgin and is naturally produced and cold-processed by us as well. In order to receive the “Extra Virgin” denomination, the oil’s acidity level has to be below 1%. This aspect is very important, as our oil’s level tends to be around 0.3%, which is thanks to an early processing of the olives within few days after they have been picked up. On the other hand, in other countries with huge productions, like Spain, Greece or Morocco, olives are not processed as soon as they are collected. Instead, they’re piled up, waiting for the mills to be free again. As a result, they heat up, which in turn makes the future oil’s acidity reach levels as high as 20%. The solution adopted to comply with the regulation is to have the oils going through a series of chemical processes that alter their natural organoleptic characteristics and make their quality and properties far worse than a cold-processed olive oil. However, the EU still allows them to be labelled and sold as “Extra Virgin”. This is one of the reasons why there seems to be great variations among different extra virgin olive oils. Montali Country House is placed on the top of a hill and lies within a 25 acre field where we planted 1500 olive trees. Our rocky soil is the perfect basis for them, as it enhances the oil quality and aroma. Although the nature of a poor ground as ours causes the production to be smaller than in softer, more fertile areas, the exceptional quality of the result makes it worthy for us. Besides, several varieties of trees take part in the process of making our oil. The reason why we do this is because we know that the best oils are the result of mixing up different olive plants. Most of our trees are Frantoio and Leccino (which improve the pollination of the trees), but there are also 10 more species involved in the task, adding hints of fruttato, the oil’s natural flavour, as well as a subtle but wide range of nice scents. Thanks to the hotel’s location, our trees are not affected by the olive fruit fly (Dacus olea), a very common insect that burrows a larva inside the olive and spoils it, adding a typical bitter taste to the oil. The fly’s natural environment tends to be a wind-protected area, like the Trasimeno Lake surroundings, so this might be a good moment for us to tell you it can get a bit a windy around here! All the olive oil we use to cook and sell at the hotel is extra virgin and is naturally produced and cold-processed by us as well. In order to receive the “Extra Virgin” denomination, the oil’s acidity level has to be below 1%. This aspect is very important, as our oil’s level tends to be around 0.3%, which is thanks to an early processing of the olives within few days after they have been picked up. On the other hand, in other countries with huge productions, like Spain, Greece or Morocco, olives are not processed as soon as they are collected. Instead, they’re piled up, waiting for the mills to be free again. As a result, they heat up, which in turn makes the future oil’s acidity reach levels as high as 20%. The solution adopted to comply with the regulation is to have the oils going through a series of chemical processes that alter their natural organoleptic characteristics and make their quality and properties far worse than a cold-processed olive oil. However, the EU still allows them to be labelled and sold as “Extra Virgin”. This is one of the reasons why there seems to be great variations among different extra virgin olive oils.